As The Car Market Moves East, An Extravaganza In Shanghai : The Two-Way China is the world's largest auto market. NPR's Frank Langfitt went to Shanghai's sprawling auto show this week, and compares it with the ones he used to cover in Detroit a few years back, when General Motors and Chrysler were on the ropes. Models abound at this week's Shanghai auto show. This one, in a latex cat suit, was drawing attention to an SUV by Landwind, a Chinese company that sells about 10,000 vehicles a year. If you visited the Shanghai and Detroit auto shows in recent years, you could sense the auto world's center of gravity shifting from West to East. Around the time of the GM and Chrysler bankruptcies, I covered a show in Detroit where GM was actually shedding brands. Displays for Saturn and Hummer, which GM tried and failed to sell to a Chinese company, were pushed to the side in Detroit's Cobo Center like leftovers at a yard sale. 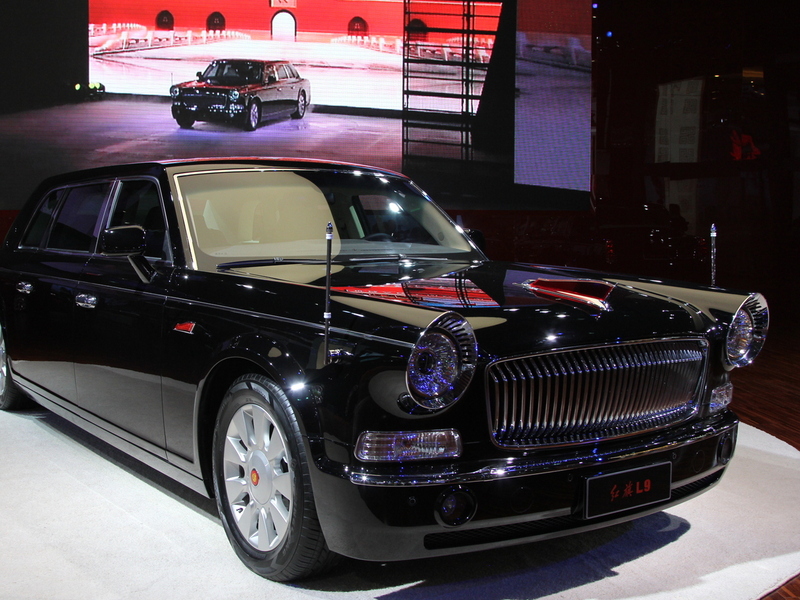 Among the exhibits was Red Flag, the Chinese auto brand famous for grand, black limousines favored by Communist Party leaders. In 2009, China passed the U.S. to become the biggest auto market in the world. The U.S. auto business is much healthier today, and the Detroit show has bounced back. Twenty-six manufacturers held press conferences there this year. In Shanghai, by contrast, more than 90 carmakers made presentations across 17 convention halls that dwarfed Cobo. In 2010, it took a few hours to walk the Detroit show. I had to return to the one in Shanghai this week for a second day and still didn't see everything. One reason the Shanghai show is so huge is because China has so many small car companies, just as the U.S. did back in the early part of the 20th century. Another is because the China market is now so big it's become a magnet for automakers from around the world. Light vehicle sales in China topped 19 million last year, compared with more than 14 million vehicles in the U.S. the same year — which was a five-year high. In the hall devoted to luxury cars, there was an exhibit by Carat Security Group, a multinational firm that makes armored vehicles, including a blue, two-tone, bulletproof limo on display. Nearby stood Eterniti Motors of London, a boutique luxury automaker; and Brabus, a German firm that custom-tunes cars. 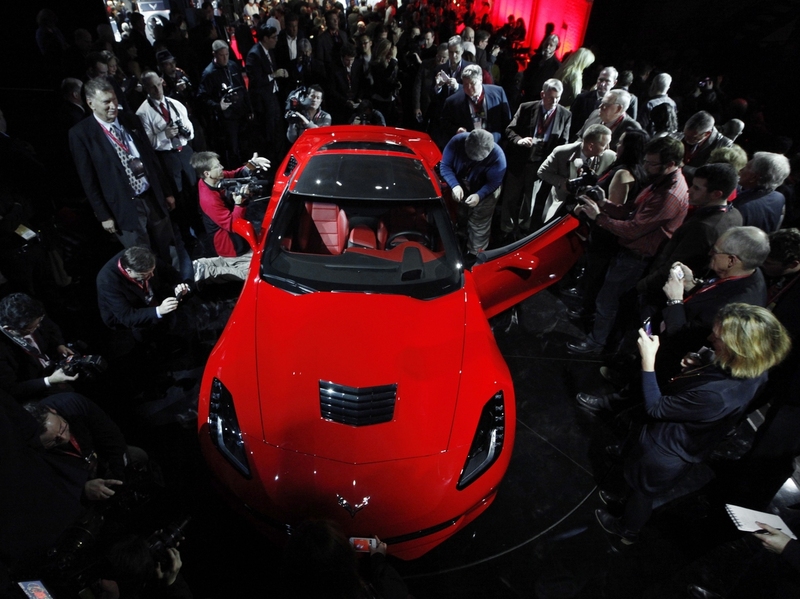 In this photo from this year's Detroit auto show, journalists surround General Motors' new 2014 Chevrolet Corvette Stingray. Maybe I should have, but I'd never heard of any of these companies. Brad Wernle, a senior writer with Detroit-based Automotive News, explained. "China is where it's happening now," he said, as we tried to talk over the din of blaring music from a nearby stage. "You have to be here in China if you're in the auto business." "The forecasts are that the Chinese market will be 30 [million] to 32 million by 2020," he continued. "That's larger than the U.S. and European markets combined." Wernle says these forecasts may prove overly optimistic. After all, Beijing's road system often feels like a slow-moving parking lot, and the air, at times, is unbreathable. But per capita car ownership in China's smaller, inland cities is still relatively small, and that's where companies hope to make their money. Beyond size, the Detroit and Shanghai shows have a different style and feel. Over the years, Detroit became known for stunts designed to create buzz. In 2008, Dodge introduced the new Ram pickup by driving more than 100 head of longhorn steer through the city streets. The Shanghai show is geared more toward Chinese consumers, many of whom are looking to buy a car for the first time. Instead of livestock, the Shanghai show attracts attention with scores of Chinese models dressed in black cocktail dresses or long gowns, slit down the side. The most striking model this week was a woman in a skintight, latex cat suit — complete with inflatable tail. Sporting a pink wig, she posed on the hood of an otherwise nondescript SUV built by Landwind, a Chinese company that sells about 10,000 vehicles a year. About two dozen photographers strained against the rope line to capture her picture. What would be decried as shockingly retro and sexist at the show in Detroit was a big hit among male customers here in Shanghai.